Just like one size uniform doesn’t fit all of your employees, one fire extinguisher doesn’t fit every type of business. Unfortunately, many business owners don’t go far enough in developing a business fire safety plan because they assume that one size fits all. Just like one size uniform doesn’t fit all of your employees, one fire extinguisher doesn’t fit every type of business. 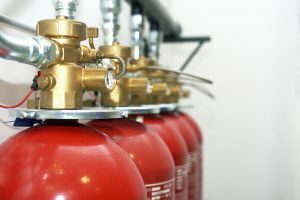 What type of fire extinguisher is the right fit for your business to protect your property and employees? These fires are ordinary combustibles made of common flammable materials like wood, textiles, plastics, and trash. Class A fires are very common throughout residential and commercial properties and many different industries. Class A fires are typically extinguished with water or monoammonium phosphate fire extinguishers. Class B fires are started with a flammable liquid or gas, like petroleum-based oils, paints, kerosene, gasoline, or propane. Many commercial industries have Class B fires due to their usage of fuels and lubricants in their daily operations. These types of fires are typically extinguished by removing oxygen from the area and fire extinguishers with fuel-specific chemical reactions. Class C fires have electrical components or electrical equipment involved. This electrical equipment can include motors, appliances, and electronic transformers. Many different industrial facilities have Class C fires due to energy use and the heavy electronic equipment present in their workspaces. The best fire extinguisher for Class C fires is cutting the power supply and using a non-conductive fire extinguisher to put out the blaze. Class D fires are caused by combustible metal like titanium, magnesium, aluminum, or potassium. Class D fires are very common in lab and industrial environments, but they can occur in other areas that aren’t used to working with these dangerous flammable metals. Class D fires are best put out using a dry powder fire extinguisher designed to handle these blazes. Class K fires are specific to kitchens and restaurants and very common throughout the country. Cooking fuels can include a wide variety of gases and liquids. Wet chemical fire extinguishers are the most effective and popular method for putting out these dangerous fires before they have the chance to spread. This entry was posted on Monday, April 24th, 2017 at 12:22 pm. Both comments and pings are currently closed.